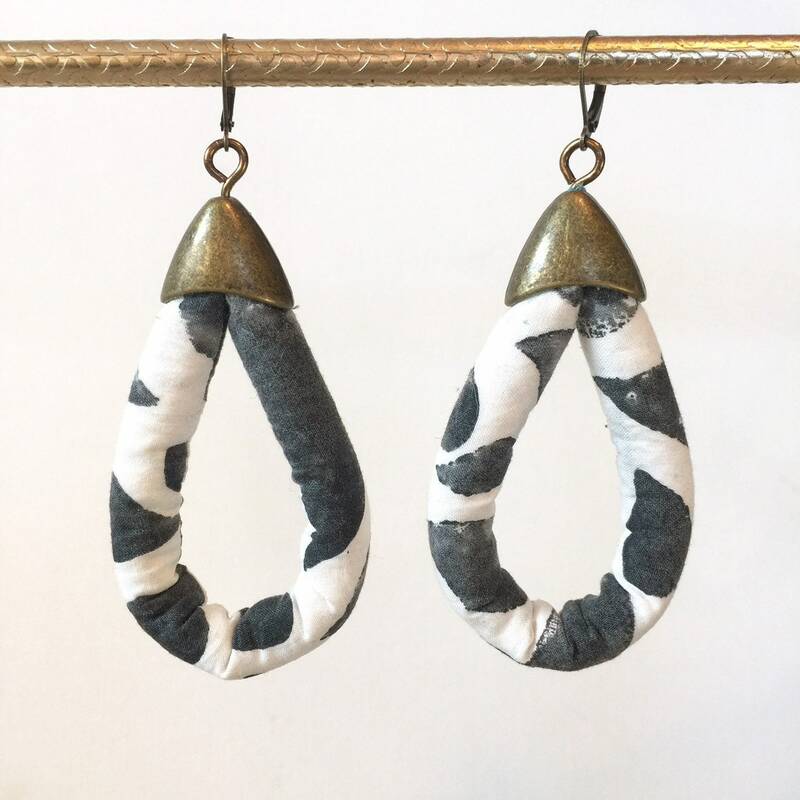 A beautiful pair of long length statement earrings, these are made with thick 1/2 inch hand-sewn block printed fabric cord. The colors are charcoal gray and white. These earrings are very lightweight and are 3” long by 1.5” wide. The metal accents are antiqued brass, finished with hypoallergenic brassleverback ear wires. * Pattern placement on the fabric may vary as each piece is one of a kind. Red and pink tone earrings made with vintage Japanese kimono silk and antiqued brass accents. colorful fun lightweight hypoallergenic. Red tone earrings made with vintage Japanese kimono silk and antiqued brass accents. Colorful, fun, lightweight, hypoallergenic. I am loving the versatility of my new necklace. I can change the length by adjusting the chain making it look like I have multiple necklaces instead of one with a single option length. I’m a University of Michigan fan, so the colors of my necklace are perfect. I’m going to need more of these necklaces in some of the other vibrant colors! Gorgeous, high quality earrings that pop. Arrived right away in beautiful packaging. Will buy more! Absolutely exquisite! Couldn’t be more thrilled with the quality and character of these beautiful one of a kind pieces. Whimsical but well made, and worth every penny. Purchases were thoughtfully packaged with beautiful detail and promptly delivered. We love FormodaDesign! Pale green tone earrings made with hand dyed two-tone silk and antiqued brass accents. elegant, bohemian, fun, lightweight, hypoallergenic. Teal tone earrings made with vintage Japanese kimono silk and antiqued brass accents. Colorful, fun, lightweight, hypoallergenic. Rust tone earrings made with soft hand dyed two-tone silk and antiqued brass accents. elegant, bohemian, fun, lightweight, hypoallergenic.